Summer is for family and fun, but that doesn't mean that kindness and service need to take a holiday. These lazy days provide all sorts of opportunities to keep exercising that kindness muscle and remind little ones that there is great joy in giving. These eight activities will help you create a memorable, heart-filled summer. Create guerilla art. Decorate stones to leave at the park; create origami animals to place in small nooks or hang from trees; make a wish tree in your front yard or at the park; write cheery messages with sidewalk chalk; or fill an envelope with interesting stuff (stickers, tattoos, bookmark, dried flowers) and leave it on a park bench addressed "For You." Spread beauty. Scatter flower seeds in empty planters, ditches and sidewalk cracks and sprinkle with your water bottle whenever you go by. Before you head out, get inspired by reading Miss Rumphius by Barbara Cooney, a lovely and wise tale about the value of bringing beauty into the world. Include a friend. When my kids were younger, we cooked and served dinner at a homeless shelter one Sunday a month. Often one of my three kids brought along a friend. It made it more festive, and introduced the volunteer experience to a new family. Choose a simple project, like cleaning a park or visiting an isolated senior, and bring along an extra kid or two. Have a play date with a purpose. Invite some kids or families over and offer an easy service project, like tying fleece blankets, making pet toys, assembling sandwiches or creating cards for hospitalized children. Surprise someone. Kids love being surreptitiously generous, so help them be Kindness Heroes. Drop cheery notes into neighbors' mailboxes. Take flowers to a nursing home and hand them around. Mail an uplifting postcard to a friend who needs encouragement. Decorate a thank-you card for the garbage or recycling collector. Get creative for charity. Want something different than a lemonade stand? Gather the kids to make friendship bracelets, candles, dog treats, paper flowers, pot holders or bath bombs. Sell them to family and friends and donate the money to a charity your family chooses together. 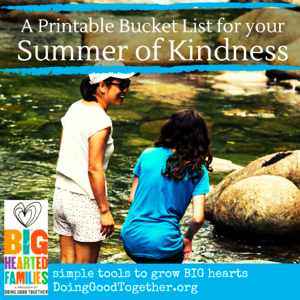 Print our Summer Kindness Bucket List. Try to check off each item before Labor Day. Then read Paulie Pastrami Achieves World Peace by James Proimos and write a book together about your family's summer kindness heroics. Make a date. Plan one-on-one time with a child you love by going on a "kindness date." We list five fun ideas in this post for the Minneapolis Foundation. Here are fun ways to keep the kindness conversations going. Print, cut and fold our kindness conversation fortune tellers. Make extras to share with your children's friends. Our conversation-prompting placemats are great for inspiring big talk at breakfast, dinner -- or a late-summer evening snack. Print our 29 conversation starters. Then crawl into a backyard tent, gather around a campfire with s 'mores, or lie under the stars -- and pose a few of these questions to your kids. Take on a summer volunteer project and use our before, during and after questions to reflect on the difference your family is making. Summer is an opportunity to spend more time reading with your kids. Check out our growing list of kindness-themed picture and chapter books. Stop at the library or bookstore for a pile to enjoy together on the beach, in a park or in a hammock. Tuck a few books in the car for when you're waiting for the doctor or in line at the grocery store.